Ministries grounded in a theology of separation tend to conceptualize ministry as a means to influence people toward a particular goal. For example, youth ministry is seen as developing relationships with teens in order to influence them toward Jesus and his lifestyle. Ministry strategies and programs are means to develop and leverage such relationships. 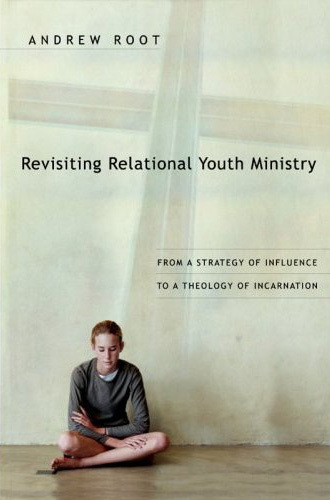 Thus youth ministry is often referred to as "relational youth ministry." The same can be said about all sorts of ministries. While I applaud the move to ministries that are more relational than the ones they replaced, I suggest that there is a better way - ministry that is grounded in and flows from a trinitarian theology of incarnation. Call it incarnational ministry. At first blush, this may seem no different than relational ministry (isn't the incarnation about relationship?). But if we look deeper, we see that the relational ministry model is about using relationships as means to other ends. In contrast, an incarnational ministry model is based on the truth that Jesus is already in relationship with us all (and we with one another in and through him). Thus relationship is not a means to some other end. It is the end in itself. I seek [in this book, to call] us beyond seeing relationships as tools for influence and into seeing the beautiful inner reality of relationships as the invitation to share each other's place, to be with each other in both joy and suffering, and in so doing to witness to Christ among us (p. 10). Ministry...is not about "using" relationships to get individuals to accept a "third" thing, whether that be conservative politics, moral behaviors or even the gospel message. Rather, ministry is about connection, one to another, about sharing in suffering and joy, about persons meeting persons with no pretense or secret motives. It is about shared life, confessing Christ not outside the relationship but within it. This I learned, was living the gospel (p. 15). This book looks fantastic and sounds refreshing. I found out it is endorsed by R S Anderson, which is always a good sign. I think this is a startling and radical insight in the Truth of that which already is, and a call to live as if it already is because it already is in the grace of the Triune God, in Jesus! If taken seriously, I think the experience of ministry would be more rest rather than labor in our life and relationships. Thanks for sharing! Very thought provoking! This is so true, and it reminds me of the one-on-one relationship I have with a young homeless man in our community. He is a Christian, but is really struggling with the concept of relationship. His addictions tend to drive a (self-perceived) wedge between him and his Savior. We often make plans to get together, and he often does not show up. The next time I see him, he usually expresses to me that he's certain I am disappointed in him. I have tried my best to help him see that I am disappointed for him, not in him. I am disappointed that he is missing out on a relationship that he can intellectualize, but can never quite realize. Thank you for sharing these insights with us. It really helps keep the things of God in proper focus and Trinitarian balance.